If your city says there's no room for better bike infrastructure to improve access to important bridge crossings, show them these street changes from NYC DOT. Parking spaces and traffic lanes have been converted to safe and comfortable two-way protected bike lanes on the approaches to the Williamsburg Bridge in Brooklyn. What's great is not only the safety of the protected lanes, but that the city took into account all the ways people on bikes approach the bridge. South 5th Place not only has a two-way protected lane, but a painted bike lane so cyclists can make convenient left turns. People don't have to choose between riding a circuitous route and riding a direct route while going against traffic, because every street leading to and from the bridge path now has a legal two-way bike route. And that means no more ticket stings for people who are just trying to get where they need to go on a bike. Posted in Bicycles. Tagged as Bicycles, bike, bike facilities, bike lanes, Bikes, Brooklyn, NYC DOT, protected bike lanes, South 5th, streetfilms, Williamsburg, Williamsburg Bridge. How about the Borinquen approach? How does that feel, now that paint is down? Everything else looks great and useful; the Borinquen approach was the one piece in the plan that felt like it didn't work, for me. I specifically didn't shoot too much over there cause I was in a hurry. And have only ridden it once. Will try to get over there my next visit, next week. But I am sure there are plenty of opinions on the way! The features shown in the video are a great improvement. I wish you had continued riding for another minute or two at the end of your video. You would have exposed some unfinished edges of the plan. Crossing signals don't seem timed well for safe crossing, but they are new and I'm assuming they will be tweaked. Still unclear how they are handling South 4th Street approach. For a period they had temporary markings guiding bikes onto the sidewalk at the corner of Havemeyer. They seem to be gone now so there's no logical connector between the bike lane on S4th and the interection lanes at Havemeyer other than a busy sidewalk or to ride against oncoming traffic. 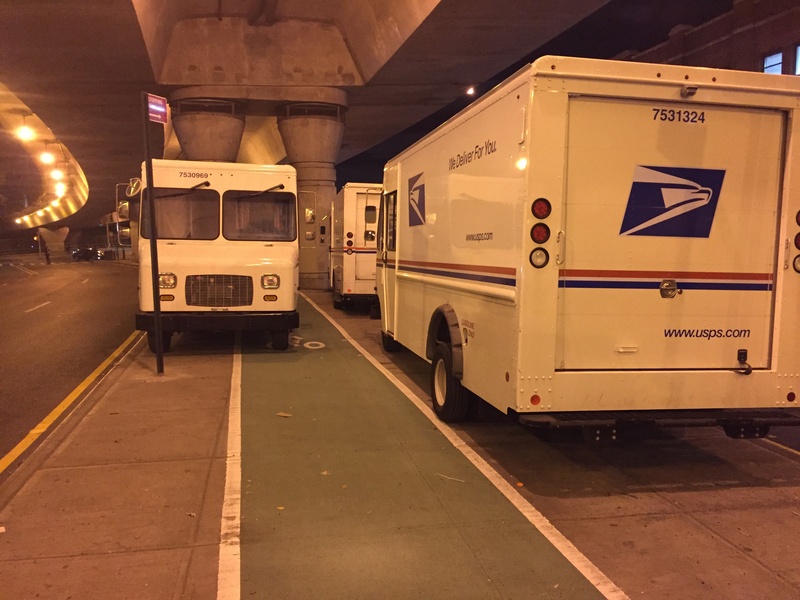 The eastbound lane that runs along the median of the BQE is crammed full of Postal Trucks every night on my commute home. Barely room to ride through, and deffiniely not at speed. Photo below. Like I posted, I was in a hurry and rush to another shoot. I only got to ride a bit past that point. Hopefully can check that out more on another visit. But people should keep up the documentation. Maybe there is a way NYC DOT can place some steel bollards to protect the bike dedicated way? I hope so. And the DOT has been doing good work, little by little. I'm pleased. Also notice the bollards at the entrance to the bridge path. The West Side Path may not have been protected from an errant car, but these paths are. I gotta say, little by little some great stuff. Also some sad missed opportunities. But give them credit where they make it happen. Like here. It's good coming from Borinquen Place. The problem is going the other way. The bike lane on S.4th Street leaves an eastbound rider with nowhere to go upon reaching Havemeyer Street/Borinquen Place. There is an eastbound bike lane within the median of Borinquen Place (even though postal trucks park all over it); so I assume that the the idea is for eastbound bicyclists to go to that lane from the bike lane on S.4th Street. But the issue is that there is no clear way to get there, as the markings on the street give no indication. From what I observe, bicyclists who get to the end of the S.4th Street bike lane at Havemeyer Street do one of two things: either they go south (the wrong way) on Havermeyer, or they go west on the eastbound side of Borinquen Place. No bicyclists make their way to the median bike lane in the middle of Borinquen Place. Without better markings on the street at the intesection of S.4th, Havemeyer, and Borinquen, this will continue to occur. The other little problem in that area is that there is still a sign on S. 4th Street that tells bridge-bound riders to use the sidewalk. This sign needs to be taken down. I contacted DOT on both of these questions. I got a response from someone in the Office of Bicycle and Pedestrian Programs, who says that they are aware of these issues, and that they will be remedied once the installation is finished. However, that response came about three weeks ago, and nothing has changed since then. Page 13 shows the finished plan with the proposed movement. The concrete inlays are dark grey, which is probably why it's not finished. Thanks for alerting me about this. But I must say that, in the "Proposed Improvements" section, I still don't see the markings for the eastbound bike lane once you get to Havemeyer/Borinquen on S.4th Street. Perhaps bicyclists are meant to use the pedestrian crossing, because there are no explicit markings for a bicyclist's path across that intersection. Should tweet that pic to NYCDOT. When I look at new bike plan designs, photos, or videos I focus my attention on the intersections, which are often neglected. Yet all the protection in the world when traversing a block does you very little good if you still have to negotiate with lane changing inattentive drivers the most danger segments of the usual bike trip. So, props for making sure to include those in the vid. One place that could have been captured better I think is South 5th place. There it appears that bikes continuing forward would have to negotiate lanes with cars taking a right turn without any protection (unless there is signal synchronization) -- the most dangerous type of interaction from the bikers perspective. Update: I see that markings are now present at the end of the two-way bike lane where S.4th Street meets Havemeyer Street and Borinquen Place. They purport to direct a cyclist first to cross the entry lane for the car traffic headed onto the bridge, then to go on the sidewalk a bit to where the cyclist is meant to cross Havemeyer in order to access the eastbound bike lane on the median of Borinquen Place. I will check out how well it works on the way home today. I forgot to look for whether the outdated "Bicyclists use sidewalk" sign is still there on westbound S.4th Street approaching S.5th Place.